The Big Island of Hawaii is Hawaii’s biggest and youngest island, offering vacationers plenty to see and do. Some of Hawaii’s most spectacular beaches can be found here and they are much less crowded than those of Maui and Oahu. 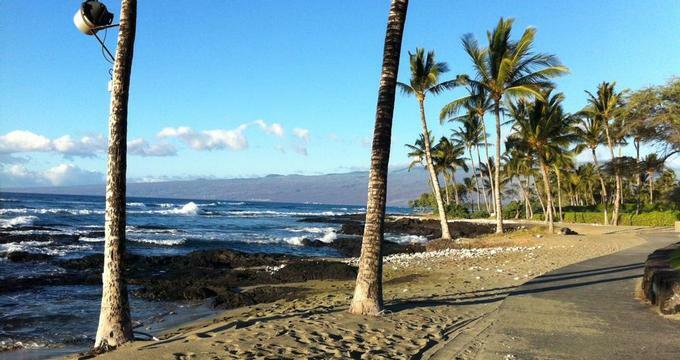 Although Kona has its charms, if you want a relaxing resort experience, head up the Kohala Coast towards the Mauna Lani and Mauna Kea resorts. There, you will find stunning sandy beaches, amazing snorkeling spots and great golf courses right on the ocean. The Mauna Lani is a lush oasis with historic fishponds and petroglyphs. There are two major hotels: The Fairmont Orchid and the Mauna Lani Bay Hotel which are both right on the water. Spend your days relaxing on the beach and next to the pool. There are two great spas at the resort where you can take fitness classes and work out in a beautiful setting. Just south of Mauna Lani is Waikoloa resort with several hotels, condo rentals and two shopping centers. Mauna Kea resort is to the north, offering two stunning beaches, golf, tennis and several accommodation options. On a Saturday morning, visit one of the farmer’s markets in Waimea where vendors sell locally-grown produce such as papaya, mangos and avocados. If you visit during the mango season in the summer, you can taste some of the most amazing mangos in the world here. The drive takes about 30 minutes from the Mauna Lani. Visitors can dive up to the Mauna Kea Observatories, situated at 14,000 feet above sea level. The Hilo side (East Side) is much more lush and green than the Kona – Kohala (West Side). Hilo has a great farmer’s market. Along the way, you can admire waterfalls and botanical gardens. Waipio Valley is a beautiful destination for hikers who enjoy great views and tropical surroundings. The Kona Coffee Cultural Festival encompasses over 30 events at various locations on the Big Island and celebrates the annual harvest, one of the most economically important harvests on the island. The festival takes place in the first week of November and offers a variety of events, ranging from samplings to several contests, such as the bean picking contest. Visitors can learn about the history of coffee growing in Hawaii: how the first tree was planted in 1828 or 1829, why Kona with its volcanic soil was perfect for these plants, and the economic importance of coffee today. Visitors can take a tour of a working farm and learn about traditional growing, picking and roasting. The area also offers unique shops, art galleries and many opportunities to sample delicious the brew. For a complete schedule of events during the festival and for more information, visit konacoffeefest.com. The web site offers a map of the driving tour with a list of farms and and other local stops. If you want to get married at an oceanfront resort in Hawaii, Hilton Waikoloa Village on the Kohala Coast of the Big Island offers a full range of services to help you plan you special day. The resort has an on-site Wedding Planner Atelier, located in the Lagoon Tower, where couples choose from a menu of packages. Venues include the Palace Gardens, Hale Aloha, a pavilion, or an ocean-side quaint gazebo. After the ceremony, the couple goes on a Just Married canal boat ride. Packages start at $1,500 for a Minister, cake and Just Married boat ride. This large resort offers couples many choices. There are three freshwater swimming pools, a saltwater lagoon, a spa, tennis courts, golf and nine restaurants. We like the rooms overlooking the dolphin lagoon in the Lagoon Tower. You'll be able to listen to the gentle sounds of the dolphins and watch the Dolphin Encounter from your balcony. This tower also houses the spa and the tennis center. If you are looking for quiet relaxation time by the pool, the Ocean Pool in the Ocean Tower is for adults only. Book a room in the Ocean Tower for quicker access. Try Imari, the resort's Japanese restaurant which provides a romantic setting surrounded by a Zen garden and Asian art. >Find out more about Hilton Waikoloa Village on the Big Island. Art lovers shouldn't miss a tour of the Hilton Waikoloa Village art collection. All around the resort, one can admire 1,800 objects valued at more than $7 million that range from Asian sculpture and paintings to spirit boards from New Guinea. Pick up the resort's Self-Guided Art Tour booklet that will help you plan your own tour around the property. Twice a week (currently on Thursdays and Sundays at 10am), guests can take the complimentary Pacific Art Tour. The resort also offers a complimentary Facility Tour daily at 9am. If this is your first visit, this tour will help you get oriented on this 62-acre property with three pools, nine restaurants, and three guest room towers.